Fashion Design Course at Just Designs Institute, will take your ideas from pencil and paper to pattern and muslin and, finally, to the runway. You will be guided, instructed, trained and mentored by our faculty of industry professionals. Our Fashion Designing & Apparel Merchandising course is Full-time program which immerses the student in the practical application of pattern making, garment construction, draping, industrial sewing and finishing techniques; the creative process of fashion illustration, design concepts and portfolio development; the fashion know-how of textiles, fashion history, fashion elements and fashion show production; to the essential skills of business, marketing, art and technology. This Fashion Design course is best and very fruitful for the aspiring Designers. Holistic inputs on generic design with more focused approach towards apparel inculcate the ability to develop and channelize creativity. 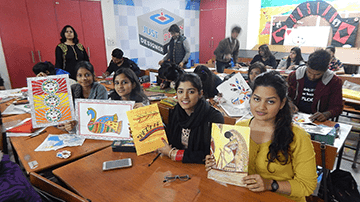 The curriculum curriculum of fashion designing courses hones design sensitization, which balances global fashion aesthetics with an Indian soul. It addresses needs of the export market as well as both couture and Prêt-à-Porter clothing in India, expanding and categorizing apparel design into niche segments. The course covers all aspects of fashion from the source of inspiration to the production of original prototype. 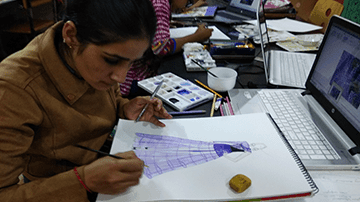 If you have an eye for fashion and want to learn the basic art and science of fashion designing, then this is the course designed exclusively for you to bring you closer to the industry. Fashion Business Management program gives students a deeper understanding of the business of fashion and what it takes to create successful fashion products.The philosophy of the Fashion Business Management course revolves around 3 pillars: Discovery, Experimentation & Self-affirmation. Use design theory to solve fashion design problems. Create original garments that exceed industry design and quality standards. Understand the relationship between fashion illustration, apparel design and product development. Effectively communicate design ideas between various manufacturing, marketing and merchandising components of the industry. Describe the role fashion history plays in fashion styling, design and display. Analyze garment construction for quality, efficacy of design, and price point. Understand the product development, apparel production, and apparel merchandising. Understand the importance of fashion forecasting on the design, marketing and merchandising of apparel. Develop a professional Fashion Designer Portfolio. 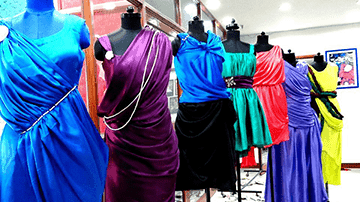 Enrol for Fashion & Apparel Merchandising Courses at Just Designs Institute. Our centers: Noida, New Delhi, Zirakpur, India.